Found one file extension association related to ZiLOG Developer Studio and 1 file format developed specifically for use with ZiLOG Developer Studio. Developer / company: Zilog Inc.
ZiLOG Developer Studio (ZDS). is used to develop software for ZiLOG's Z8/Z8Plus/Z89C00/eZ80/Z380 eZ80 microcontrollers and microprocessor families! ZDS can be used either as an integrated component of ZiLOG's Support Product toolkit, or as a stand-alone, full-featured macro assembler for use by assembly language programmers. 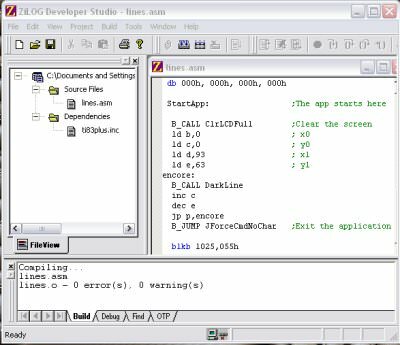 ZDS consists of the ZiLOG Macro Cross Assembler, Linker, and Editor. It includes Debugger support for Z8/Z8Plus/Z89C00/Z180/Z380/eZ80. If you need more information please contact the developers of ZiLOG Developer Studio (Zilog Inc.), or check out their product website.